Society founded by Baron de Hirsch Sept., 1891, and incorporated at London under the Companies' Acts of 1862-90, with a capital of £2,000,000, divided into 20,000 non-dividend-drawing shares of £100 each; Baron de Hirsch subscribed for 19,993 shares; and Lord Rothschild, Sir Julian Goldsmid, E. Cassel, F. D. Mocatta, and Benjamin S. Cohen of London, and S. H. Goldschmidt and Solomon Reinach of Paris for one share each. Before his death Baron de Hirsch divided his shares among the following corporations: the synagogue of Brussels and the Jewish communities of Berlin and Frankfort-on-the-Main, 3,600 shares each; the Anglo-Jewish Association of London and the Alliance Israélite Universelle of Paris, 4,595 shares each. 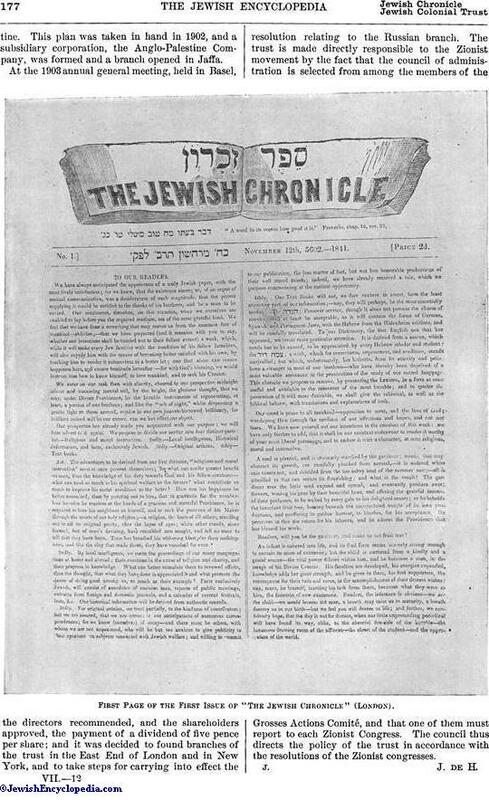 The purpose of the association is stated in article 3 of its charter as follows: "To assist and promote the emigration of Jews from any parts of Europe or Asia, and principally from countries in which they may for the time being be subjected to any special taxes or political or other disabilities, to any other parts of the world, and to form and establish colonies in various parts of North and South America and other countries for agricultural, commercial, and other purposes." 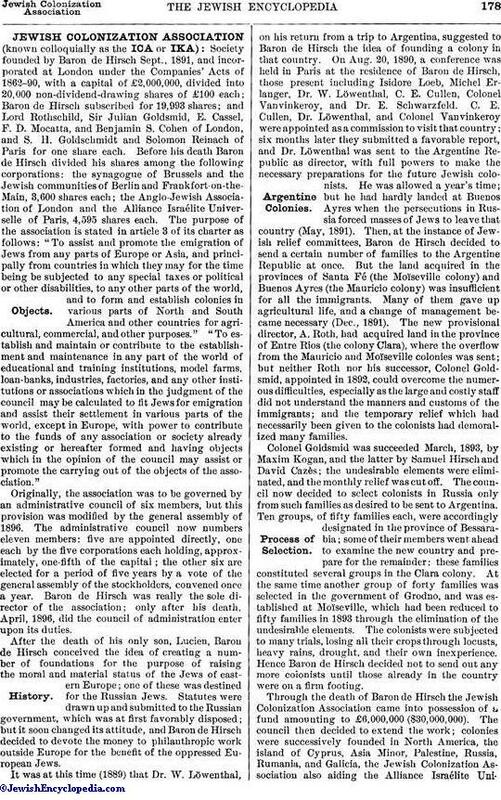 "To establish and maintain or contribute to the establishment and maintenance in any part of the world of educational and training institutions, model farms, loan-banks, industries, factories, and any other institutions or associations which in the judgment of the council may be calculated to fit Jews for emigration and assist their settlement in various parts of the world, except in Europe, with power to contribute to the funds of any association or society already existing or hereafter formed and having objects which in the opinion of the council may assist or promote the carrying out of the objects of the association." Originally, the association was to be governed by an administrative council of six members, but this provision was modified by the general assembly of 1896. The administrative council now numbers eleven members: five are appointed directly, one each by the five corporations each holding, approximately, one-fifth of the capital; the other six are elected for a period of five years by a vote of the general assembly of the stockholders, convened once a year. Baron de Hirsch was really the sole director of the association; only after his death, April, 1896, did the council of administration enter upon its duties. After the death of his only son, Lucien, Baron de Hirsch conceived the idea of creating a number of foundations for the purpose of raising the moral and material status of the Jews of eastern Europe; one of these was destined for the Russian Jews. Statutes were drawn up and submitted to the Russian government, which was at first favorably disposed; but it soon changed its attitude, and Baron de Hirsch decided to devote the money to philanthropic work outside Europe for the benefit of the oppressed European Jews. It was at this time (1889) that Dr. W. Löwenthal, on his return from a trip to Argentina, suggested to Baron de Hirsch the idea of founding a colony in that country. On Aug. 20, 1890, a conference was held in Paris at the residence of Baron de Hirsch, those present including Isidore Loeb, Michel Erlanger, Dr. W. Löwenthal, C. E. Cullen, Colonel Vanvinkeroy, and Dr. E. Schwarzfeld. C. E. Cullen, Dr. Löwenthal, and Colonel Vanvinkeroy were appointed as a commission to visit that country; six months later they submitted a favorable report, and Dr. Löwenthal was sent to the Argentine Republic as director, with full powers to make the necessary preparations for the future Jewish colonists. He was allowed a year's time; but he had hardly landed at Buenos Ayres when the persecutions in Russia forced masses of Jews to leave that country (May, 1891). Then, at the instance of Jewish relief committees, Baron de Hirsch decided to send a certain number of families to the Argentine Republic at once. But the land acquired in the provinces of Santa Fé (the Moïseville colony) and Buenos Ayres (the Mauricio colony) was insufficient for all the immigrants. Many of them gave up agricultural life, and a change of management became necessary (Dec., 1891). The new provisional director, A. Roth, had acquired land in the province of Entre Rios (the colony Clara), where the overflow from the Mauricio and Moïseville colonies was sent; but neither Roth nor his successor, Colonel Goldsmid, appointed in 1892, could overcome the numerous difficulties, especially as the large and costly staff did not understand the manners and customs of the immigrants; and the temporary relief which had necessarily been given to the colonists had demoralized many families. Colonel Goldsmid was succeeded March, 1893, by Maxim Kogan, and the latter by Samuel Hirsch and David Cazès; the undesirable elements were eliminated, and the monthly relief was cut off. The council now decided to select colonists in Russia only from such families as desired to be sent to Argentina. Ten groups, of fifty families each, were accordingly designated in the province of Bessarabia; some of their members went ahead to examine the new country and prepare for the remainder: these families constituted several groups in the Clara colony. At the same time another group of forty families was selected in the government of Grodno, and was established at Moïseville, which had been reduced to fifty families in 1893 through the elimination of the undesirable elements. The colonists were subjected to many trials, losing all their crops through locusts, heavy rains, drought, and their own inexperience. Hence Baron de Hirsch decided not to send out any more colonists until those already in the country were on a firm footing. 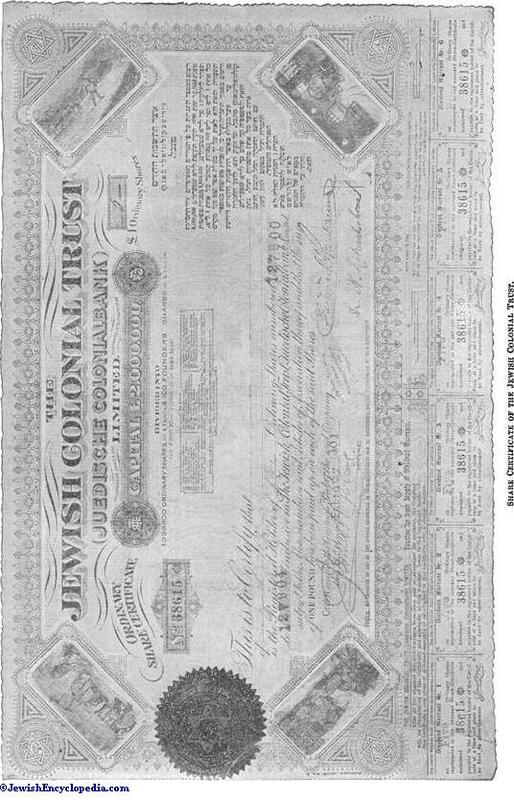 Share Certificate of the Jewish Colonial Trust. In the United States the ICA assists the Baron de Hirsch Fund principally in aiding the agricultural school at Woodbine, N. J., and the trade-school at, New York, N. Y. It has been instrumental in consolidating the colonies of Alliance, Carmel, and Rosenhayn, and has aided individual farmers in various parts of the country. It has founded, in conjunction with the Baron de Hirsch Fund, the Jewish Agricultural and Industrial Aid Society, whose object is to aid Jewish farmers and subvention the Removal Committee created by this society. Since 1892 the ICA has contributed to the founding of the Hirsch colony near Assa, Northwest Territories; it has aided the Baron de Hirsch Institute of Montreal in building and maintaining a school for the children of Jewish immigrants; and it contributes to a fund for the aid of immigrants settling in Canada. 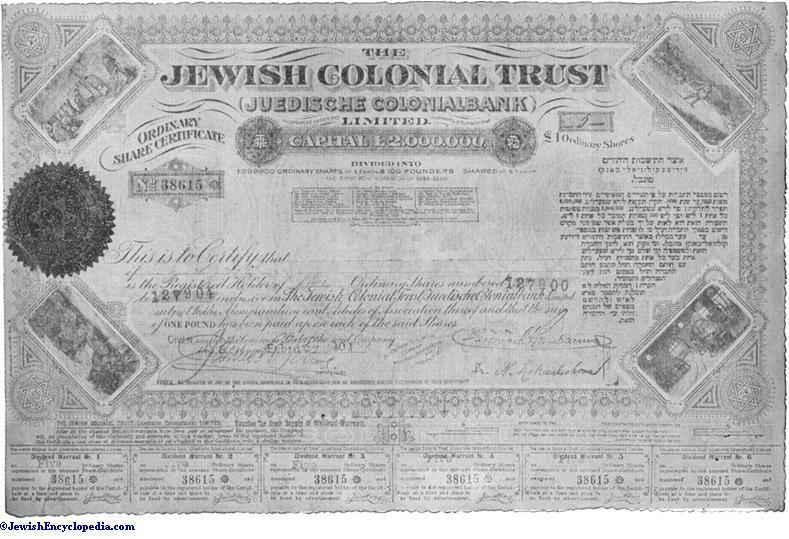 Since 1901 the Jewish Colonization Association has contributed to the foundation of a new colony near Qu'Appelle, Assiniboia, N. W. Ter., on land granted by the Canadian government to families of Rumanian Jews. In Brazil the association has acquired 3½ square miles of territory in the province of Rio Grande do Sul, where it proposes to start a colony. Since 1897 it has contributed to the foundation of a colony (33 persons) in Cyprus—Margo Tchiflik, near Nicosia, which it at present owns. The places of the former Russian colonists have been taken almost wholly by former pupils of the agricultural school of Jaffa (see Cyprus). In 1899 it acquired, near Smyrna, a tract of land covering 2,587 hectares, naming it" Or Yehudah." An agricultural school was founded there in Nov., 1900, which has now about fifty pupils. Six Jewish farmers are also established there, and seventy-six additional persons take part in the agricultural labors. Aside from the old colonies of Baron Edmond de Rothschild, of which it has assumed the management, the Jewish Colonization Association has contributed to the consolidation of the colonies Wadi el-Ḥanin, Rehoboth, Katra (Gadara), Hederah, and Mishmar ha-Yarden, and in the district of Tiberias it has exploited an agricultural tract, known as "Sajara," which is cultivated exclusively by Jewish laborers. Several of these laborers have also been established as petty farmers. In order to increase the number of merchants and artisans in Jerusalem the association has established the following: a silk-and woolen-mill for purposes of instruction, employing about one hundred persons; a knitting machine establishment, furnishing machines to poor families, which pay in monthly instalments; a dyeing establishment, the complement of the weaving-mill; a working men's quarter, in which artisans, laborers, and small traders may purchase small houses for a moderate sum; a bank that loans money on security, with moderate interest, to artisans, laborers, manufacturers, and small shopkeepers; schools for teaching girls to make lace and also nets for the hair. The loan-banks, founded since 1899, constitute the chief work of the Jewish Colonization Association in Galicia. There are now six of these in operation—at Brody, Kolomea, Rzeszow, Stanislawow, Tarnow, and Zalesczyki; and others are contemplated. Each of these institutions is managed by a council, in conformity with the Austrian laws. By the end of 1902 these banks had altogether 3,912 shareholders with 7,929 shares of 10 kronen each; the loans range from 25 to 400 kronen, repaid in small monthly instalments. Since their foundation these banks have loaned altogether 1,197,554.96 kronen. The industrial work of the association includes: the operation of knitting-mills, furnishing work for about sixty working women; the doll-factory at Tarnow, which employs one hundred men and women, and is intended to introduce the manufacture of dolls among the Galician Jews; the carpenter-shops at Stanislawow and Tarnow, for instructing boys in trades. In 1899 the association acquired the estate of Slobodka Lesna, near Kolomea, where it has established an agricultural school, with seventy pupils and eight carpenter's apprentices (1903). In Russia the association subventions agricultural, professional, and primary schools. It aids the Jewish farmers in the different governments, contributes to the loan-banks, and has established at Dubrovna a spinning-mill and a society for providing cheap lodging-houses. It has six agricultural and horticultural schools, with 210 pupils, at Czestoniew, Minsk, Moghilef-on-the-Dnieper, Novopoltawka, Orgejew, and Orsha. It supports twenty trade-schools for boys (1,916 pupils), seven trade-schools for girls (1,547 pupils), and two mixed schools, these schools being distributed in twenty-seven different localities. The association trains young men to assumepositions as directors and instructors in its schools. In the interest of primary instruction it aids the Ḥebrat Marbeh Haskalah (Society for the Spread of Enlightenment) of St. Petersburg, which subventions seventy-five schools having a total roll of more than 5,500 pupils. It aids Jewish farmers by instructing and encouraging them in employing improved methods in agriculture and fruit-growing; it plants model gardens, introduces bee-culture and mutual loan-banks, and distributes farmers' almanacs and pamphlets on agriculture. This work also extends to Bessarabia and the colonies of the Northwestern Zone and of Kherson. The association has furthermore been instrumental in forming cooperative societies among the Jewish artisans at Akkerman, Bairamtcha, Romanowka, and Tarutino, and advances funds to the loan-banks founded in the cities for the purpose of aiding especially artisans and small dealers. The thirteen banks which thus have received funds are situated in localities having a total Jewish population of 240,000 persons. The banks have altogether 7,600 shareholders; the average sum loaned is 40 rubles, and in 1902 more than half a million rubles were loaned. 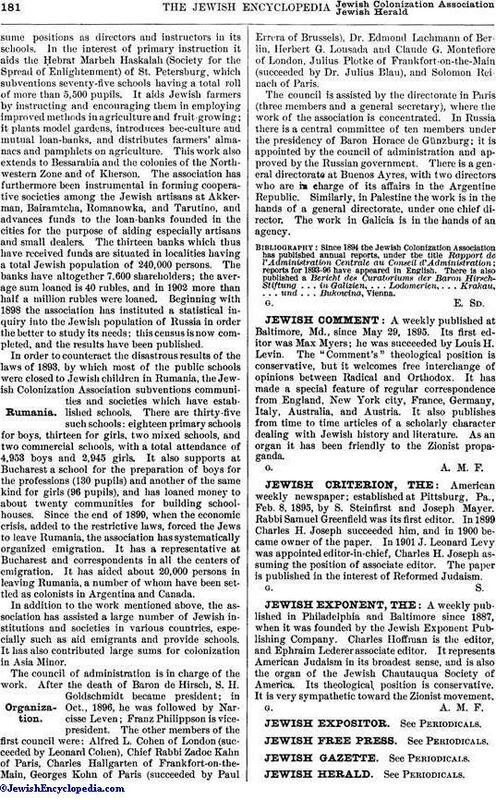 Beginning with 1898 the association has instituted a statistical inquiry into the Jewish population of Russia in order the better to study its needs; this census is now completed, and the results have been published. In order to counteract the disastrous results of the laws of 1893 by which most of the public schools were closed to Jewish children in Rumania, the Jewish Colonization Association subventions communities and societies which have established schools. There are thirty-five such schools: eighteen primary schools for boys, thirteen for girls, two mixed schools, and two commercial schools, with a total attendance of 4,953 boys and 2,945 girls. It also supports at Bucharest a school for the preparation of boys for the professions (130 pupils) and another of the same kind for girls (96 pupils), and has loaned money to about twenty communities for building school-houses. Since the end of 1899, when the economic crisis, added to the restrictive laws, forced the Jews to leave Rumania, the association has systematically organized emigration. It has a representative at Bucharest and correspondents in all the centers of emigration. It has aided about 20,000 persons in leaving Rumania, a number of whom have been settled as colonists in Argentina and Canada. 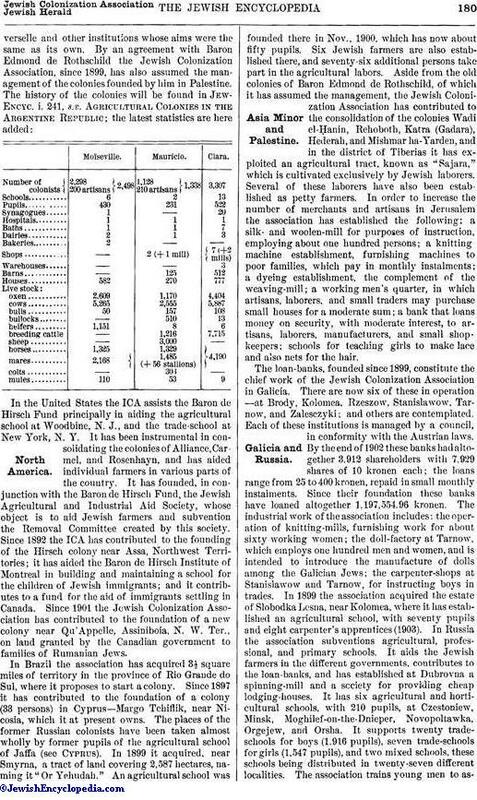 In addition to the work mentioned above, the association has assisted a large number of Jewish institutions and societies in various countries, especially such as aid emigrants and provide schools. It has also contributed large sums for colonization in Asia Minor. The council of administration is in charge of the work. After the death of Baron de Hirsch, S. H. Goldschmidt became president; in Oct., 1896, he was followed by Narcisse Leven; Franz Philippson is vice-president. The other members of the first council were: Alfred L. Cohen of London (succeeded by Leonard Cohen), Chief Rabbi Zadoc Kahn of Paris, Charles Hallgarten of Frankfort-on-the-Main, Georges Kohn of Paris (succeeded by Paul Errera of Brussels), Dr. Edmond Lachmann of Berlin, Herbert G. Lousada and Claude G. Montefiore of London, Julius Plotke of Frankfort-on-the-Main (succeeded by Dr. Julius Blau), and Solomon Reinach of Paris. The council is assisted by the directorate in Paris (three members and a general secretary), where the work of the association is concentrated. In Russia there is a central committee of ten members under the presidency of Baron Horace de Günzburg, it is appointed by the council of administration and approved by the Russian government. There is a general directorate at Buenos Ayres, with two directors who are in charge of its affairs in the Argentine Republic. Similarly, in Palestine the work is in the hands of a general directorate, under one chief director. The work in Galicia is in the hands of an agency. reports for 1893-96 have appeared in English. There is also published a Bericht des Curatoriums der Baron Hirsch-Stiftung . . . in Galizien, . . . Lodomerien, . . . Krakau, ... und . . . Bukowina, Vienna.